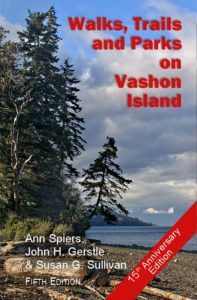 Walks, Trails, and Parks on Vashon Island guides readers through Vashon-Maury Islands’ wild woods, welcoming parks, and diverse trails from forest to cliff to beach to gravel pit. Beach access is given ample attention. Also included are nature, Island history and culture notes to deepen your enjoyment and knowledge. Clear, crisp text. Strong bibliography for deeper reading. Durable book: spiral binding, hardy paper. 125 pages. Second Printing due out in Spring 2019. 5th Edition, 15th Anniversary, $15. 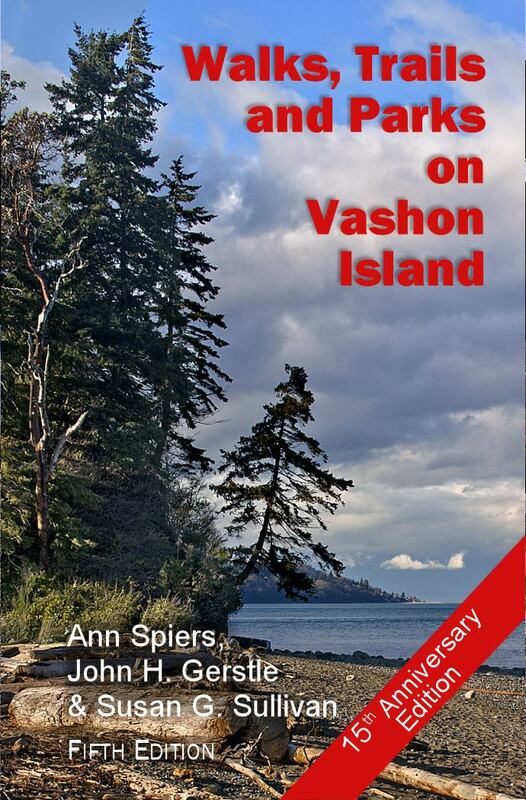 Available at Vashon Book Shop, Thriftway, SAW, Vashon E-Bike, Country Store and other great Vashon retailers. Or at Vashon Park District. Or at Third Place Books (Seward Park). To order on-line, contact Ann at spiers@centurytel.net. This guide will answer your deepest questions about Vashon-Maury: Why are those bricks on the beach? Ever done a Pier Peer? Where did the two UFOs land? When did Barred Owls arrive? What makes Purple Martins numerous some years and not others? How much money did Mrs. Dilworth pay the Island’s Native American for a bucket of blackberries? How old is the trail through Burton Acres? What do folks do at Raab’s Lagoon? Where can you walk along an exposed geologic fault? Did you know Vashon is being uplifted in a squeeze between the Seattle Fault and the supposed Tacoma Fault? Why was Lost Lake once called Spirit Lake and Lizard Lake? Where did all the beach rocks come from? Where and what elevation are the high points on Vashon and Maury? Did you know that giant rocks have official names? Copyright © 2019 Ann Spiers – Powered by Customify.